Nice weekend at the craft tent, despite the fact that I was feeling miserable because of allergies. I finally took an allergy pill yesterday, which knocked me out for the afternoon. I'd rather sneeze and get a little work done! Sue sold several gourds over the weekend; I didn't sell anything but I had a great time spinning some absolutely wonderful Jacob roving from Perfect Spot Farm down in North Carolina. I let a bunny that Cathy bought from Chris in Connecticut stay over and Cathy gave me this lovely roving in return. It looks wonderful with my handspun pure angora from my black rabbits. The angora is on the left in the picture and the Jacob is on the right. 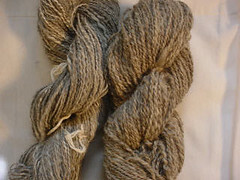 I'm thinking about using this, along with some silk noil/angora yarn that I spun up awhile back, for a lacy shawl. Since my chain shawl died of poor color choices on my part, maybe a natural colored one will work! Some time ago I bought these china blanks at an auction and decided recently that it was time to do something with them. I am no artist but thanks to the advice of several artistic people, including my cousin RJ, Kym and Sue, I finally managed to get a few pieces done that I hope will sell. 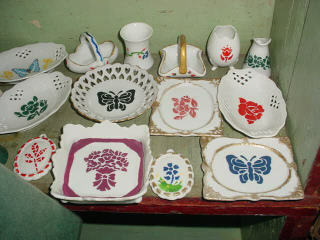 The porcelain pieces are lovely in themselves, without my little dabs on them! 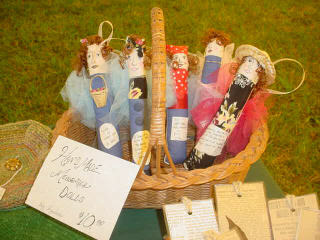 My young friend Kym sewed up the little dolls pictured above and the charming sayings and lovely little faces reflect a lot of her special personality. Kym is one of the most caring people I know and is very good at understanding other people and their feelings. She is so talented in so many ways, an artist and a poet and she communicates a depth of feeling that is beautiful to see. She thinks about life to an impressive extent and has often impressed me and given me great joy in our discussions. As I've said before, I'm so lucky to know such wonderful women! This is the hottest time we've had here so far, high 70s to just about 80 but the air is heavy and still. Nothing like other people are having to deal with but seems uncomfortable. Today I plan to shear a doe that will appreciate getting rid of all that hot, heavy hair. Then Kym and I are going to town to register at the gym and do some shopping. Looking forward to the gym trips with her and to getting the blood stirring again. This lazy week has not been one of my best!